When we first developed the SeamSAFE Roof Anchor, we designed it to be a best-in-class fall-arrest system for standing seam roofers. We ensured it met OSHA and ANSI standards and support up to 5,000 pounds. Yet, we always knew that our roof anchor, with its unique design, materials and engineering, was capable of handling significantly more weight. ​We decided to verify our instincts and took the anchor to a third-party industrial testing and certification facility. We asked for a test to determine the maximum weight our anchor could support. The results were astounding and confirmed our long-standing assumptions. Testing demonstrated that SeamSAFE Roof Anchors have the capability of supporting 10,500 pounds of weight – and they are now certified as such. The photograph at right was taken during anchor testing and indicates 10,520 pounds of holding power. Yet, the potential load factor is likely far greater. 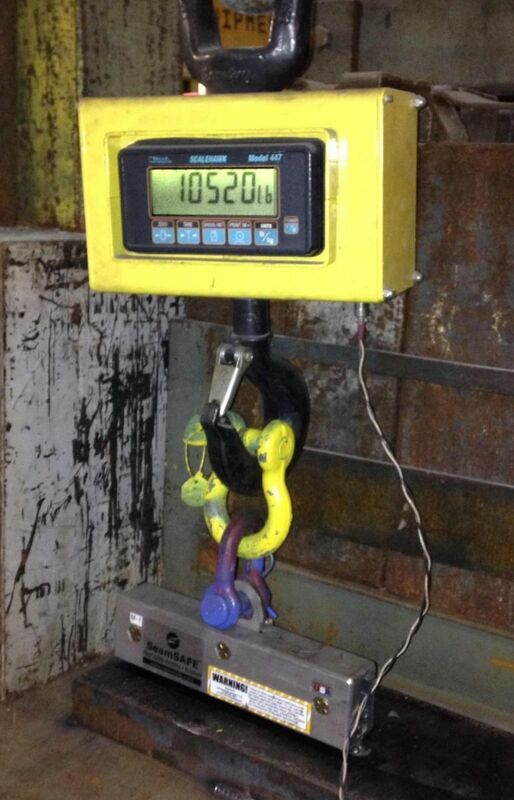 The SeamSAFE anchor was not assessed to its maximum strength since the facility did not have enough weight on hand to determine the ultimate load. SeamSAFE anchors have two metal blocks that are manufactured with 6061-T aircraft aluminum. The blocks are designed and cut to clamp on a single standing seam of a metal roof. The aluminum blocks are connected by three grade-8 shank bolts that have washers, nuts, and locking nuts on them. There is a ¼-inch, solid, stainless-steel attachment ring. The anchor works by separating the metal blocks, fitting them over the standing seam, and then tightening the bolts with a ¾-inch, box-end wrench. Installation of the anchor takes under a minute. Once a SeamSAFE anchor is properly attached to a metal roof seam and tethered to the roofer's belt, the anchor will break falls and keep the roofer safely on the roof. 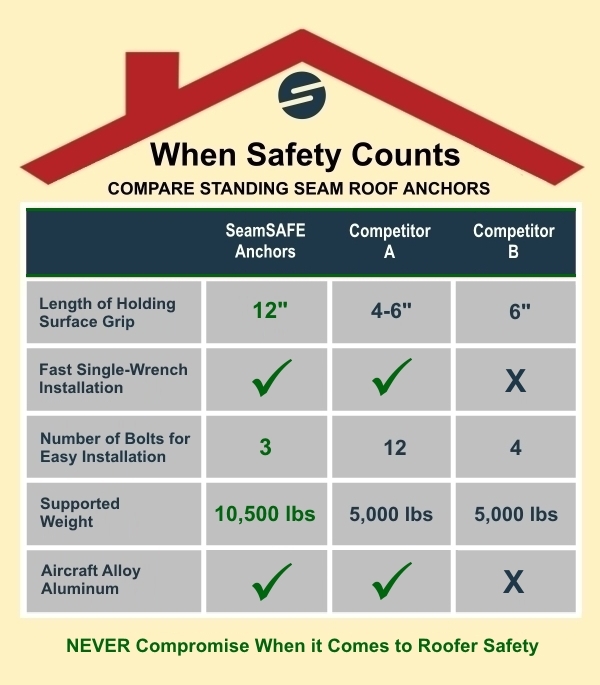 The chart below references how SeamSAFE anchors compare to other safety anchor options for standing seam roofers. This article was written by specialty roofer and SeamSAFE inventor Doug Mullins. Doug has more than 40 years in the roofing industry. His own experience with a life-threatening fall from a standing seam metal roof inspired him to create SeamSAFE Roof Anchors. Today, SeamSAFE anchors and accessories are widely used by roofing companies, contractors, and even NASA. For more information, visit www.seamsafe.com.